Twitter is a popular social media network, most well known for its short-and-sweet, concise outbursts of information in the form of “tweets.” For over 10 years now, the app has been used among teenagers, celebrities, businesses of all kinds, and even high-ranking government officials. 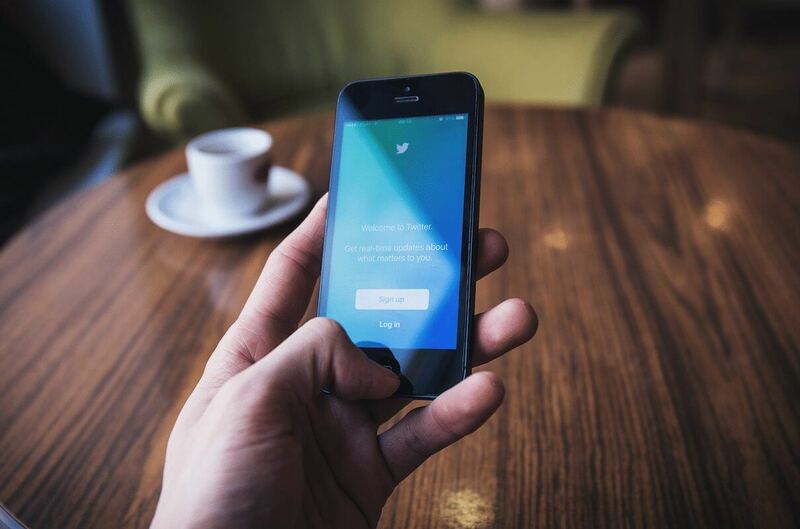 Though many people are familiar with its basic functions, few know how to fully take advantage of Twitter as a key part of forming a positive, online presence. Whether you use a personal or company Twitter account, the app’s metrics provide a great structure for polishing and creating a strong brand for your name. Before getting started, take a minute to google yourself and review your privacy settings on all your private social media profiles. Is there anything you would not want your future employer to see? Have you tweeted anything unprofessional in the past? Once you start working for a certain company and attach the brand’s name to your name, you start representing the company so you need to make sure that you represent it well. It’s ok to keep your private social media accounts, just make sure that you set them on private and your posts are not showing up in a search. 1. 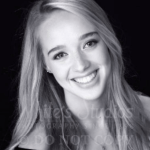 Start with uploading a professional, simple headshot. As you can see, our CEO Jon Ferrara has a great photo of himself looking confidently at the camera. When someone finds his Twitter account, they will be able to connect his name to his face and remember him and his brand more significantly. It’s also wise to use this same photo for all of your personal social media accounts so people will become consistently more aware of who you are and what you represent. They will also be certain that this profile is certainly his, and they will be more easily able to connect with him on other social platforms. You should also consider putting an image as your background, of anything that reflects who you are or is important to you. For example, I used a pretty photo of a beach in Santa Monica, my hometown. How is it possible to fully summarize who you are in only 160 characters? It may seem limiting, but it’s not as hard as it sounds. One of the rules I like to stick to is focus on keywords and hashtags. The awesome thing about Twitter is that everyone’s bio searchable. This means you should tag your company’s name, including any relevant hashtags, and other words to describe the field you’re in. If you’re in transition between jobs, you can state this in your bio and use a hashtag for the type of positions you’re interested in. For example, #DigitalMarketing, or #Sales. 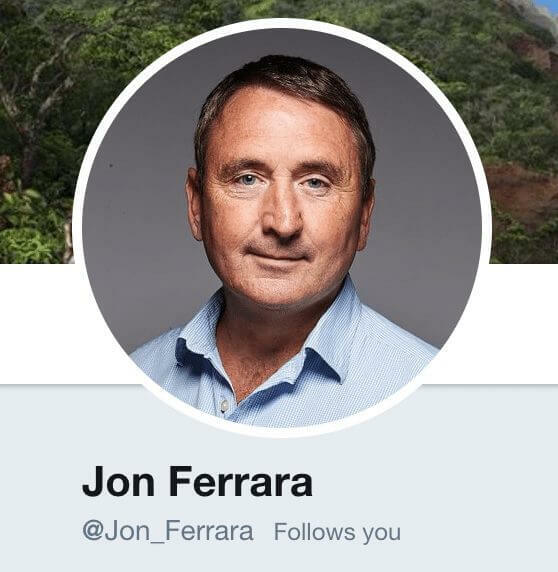 Our CEO, Jon Ferrara’s bio sets a great example. 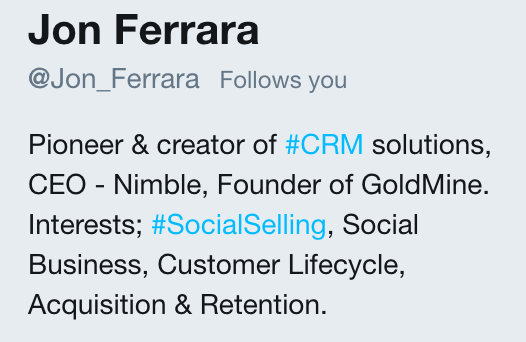 Jon is a creator of CRM platforms and is one of the pioneers of the term Social Selling, so you can see why’d he make a point of hashtagging these words in his bio. His bio is straightforward and explicitly tells you his interests and career field. On top of this, he has utilized two effective hashtags in order to gain engagement. Julia introduces herself right off the bat as a “globetrotter,” and I immediately have the sense that she is worldly and adventurous. She also mentions that she is a “wine-luster,” which gives her account a much more personable twist. 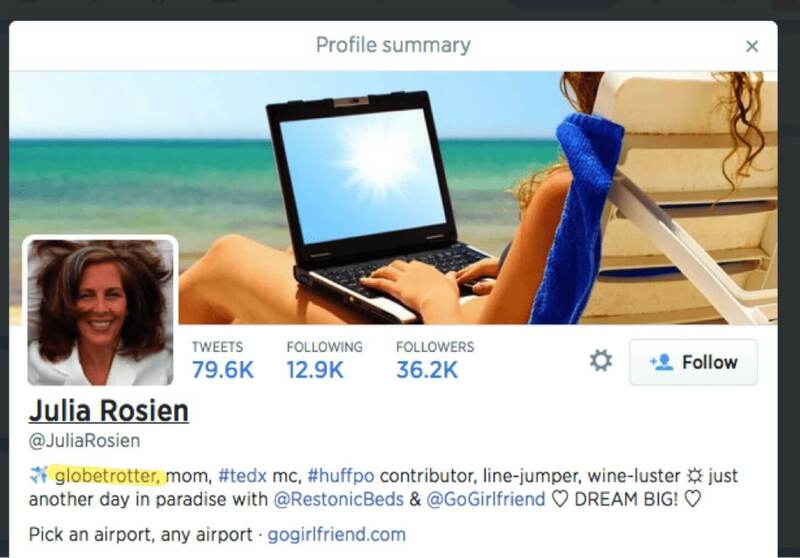 However, she still includes notable hashtags and redirects Twitter users to her company accounts. This Twitter user has given himself an edge among other Twitter users by connecting his position as a business investor to a person who invests in people and great ideas. This lead-in makes you wonder more about the work he does and the kinds of things he invests in. What kind of people? What kind of great ideas? If you’re a student, you can transition your followers into connecting with you on your LinkedIn account to learn more about you and your career goals. If you’re a developer, you can link users to GitHub. Bloggers, you can link to your own blogs, and content managers can link to the blogs they manage. Lastly, salespeople can include their phone number in their bio so people can call them directly. 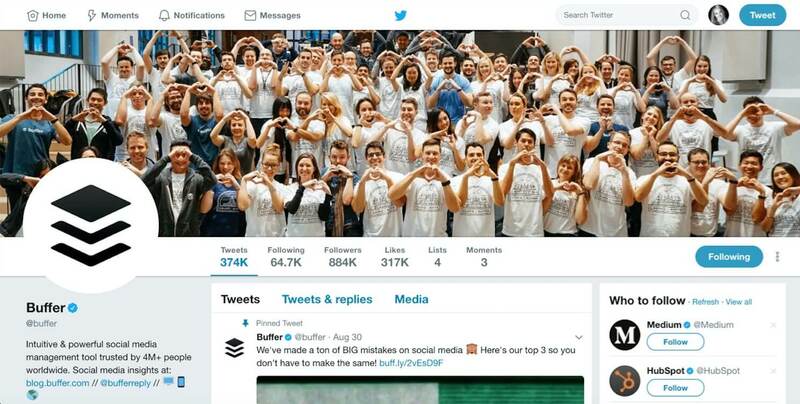 Of course working and perfecting your own content is important, but you shouldn’t complete the first two steps without following through and completely immersing yourself in the massive network of Twitter. You should start doing this by searching for companies you’d like to connect with, bloggers who write content about your career field, and any other accounts that relate to your broader interests and hobbies. For example, since my career path is in marketing and tech, I follow Bryan Kramer, Elon Musk SoundCloud, and TechCrunch. But, since I love to dance and I LOVE food, I follow accounts such as Hip Hop International and Buzzfeed Tasty. To keep your feed relevant, you should think twice about who you follow. There’s no real need to follow every single childhood friend if you want to keep your feed giving you marketing news, for example. 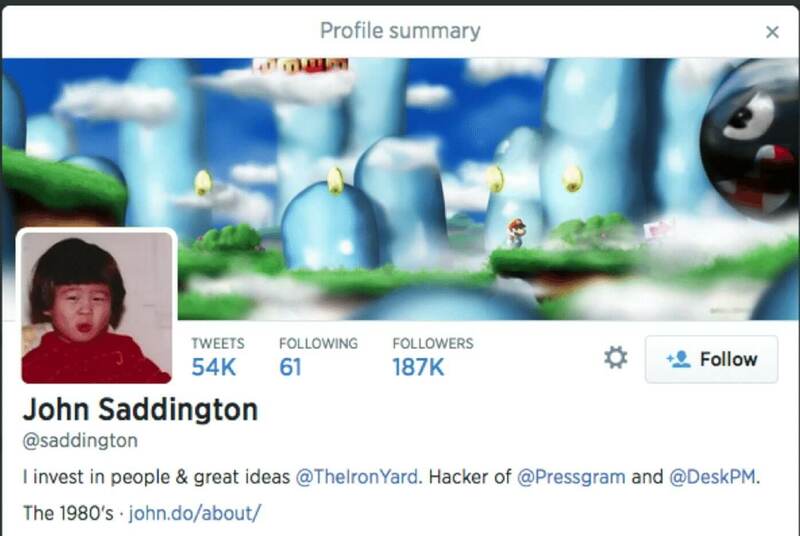 Now that you’ve created a personal professional Twitter page, you can begin to set one up for your company. And yes, we absolutely recommend having both! The differences in set up between these two types of accounts are not drastic. After all, the goal is to maintain and uphold your brand by appearing professional and authentic to who you are. 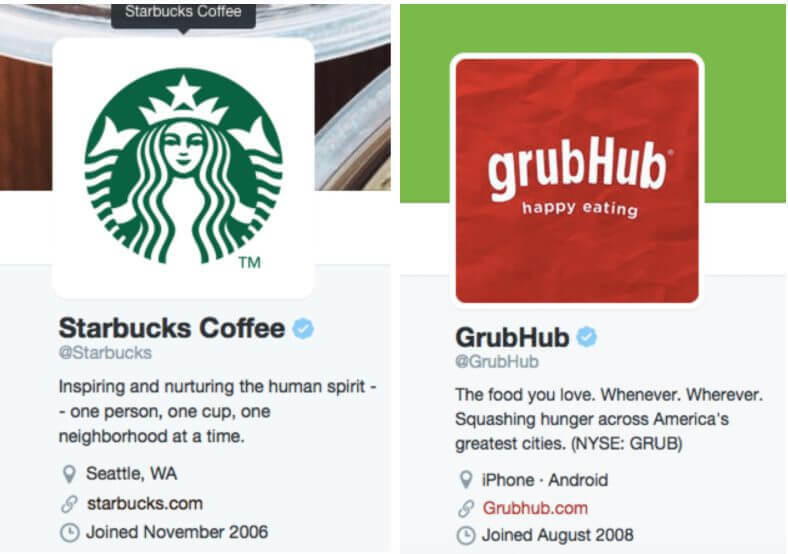 Use the same logo for your company’s Twitter icon as you do for your website and all other social accounts. Again, this is the easiest and most effective way for people to remember your company’s presence. Changing even just one of these logos could potentially confuse online users and question whether or not the Twitter account is in fact still your company. You should also consider designing an exciting graphic image for your background with Canva, using a fun, creative image of your company. Here are some examples of different approaches people have taken with their background image. Again, you only have 160 characters to get people excited, so it’s extremely important to make the best of it. It’s very easy to state directly what you do, but to some users, you may sound like all of the other competitors. Try to focus on what makes your company unique, and channel it into a broader idea or set of values. These two major companies do a great job and hooking an online user and sharing with the Twitter network more than just what they do. Of course, Starbucks is “just” a coffee shop chain and GrubHub is just a food delivery service app, but their creative bios entice users and connect them to bigger ideas in the world. However, for smaller companies trying to get their name out there in the first place, you should pair this catchy tagline with a few keyword hashtags about the field you’re in. The true power of Twitter branding and networking is engagement. Without liking, retweeting, and replying to other people’s tweets, no one will ever come across yours. Additionally, these seemingly small gestures do a great deal when trying to get your foot in the door with another professional or a company. It’s likely that as you continuously show up in these accounts’ notifications, they will become aware of you and the brand you represent. 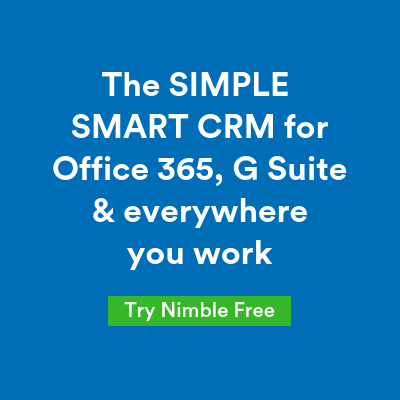 Start off by following us on Twitter at @Nimble and let us know if you have any questions about setting your Twitter accounts. We’re happy to help! Twitter provides an amazing network for people and companies beginning their careers or exploring the levels at which they can grow. It’s an app you certainly want to be using no matter what career field you may be in. Start putting yourself and your brand out there– 140 characters at a time.